This page gives you information about the BIS Data Enquiry service provided through LERC Wales Aderyn as well as allowing you to start an online Data Enquiry (DERF) request. All users requesting information must agree to comply with the terms and conditions of data release. 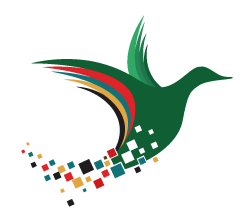 In order for BIS to release data that includes full resolution sensitive species information, you must indicate your agreement to these terms and conditions when completing the online DERF. 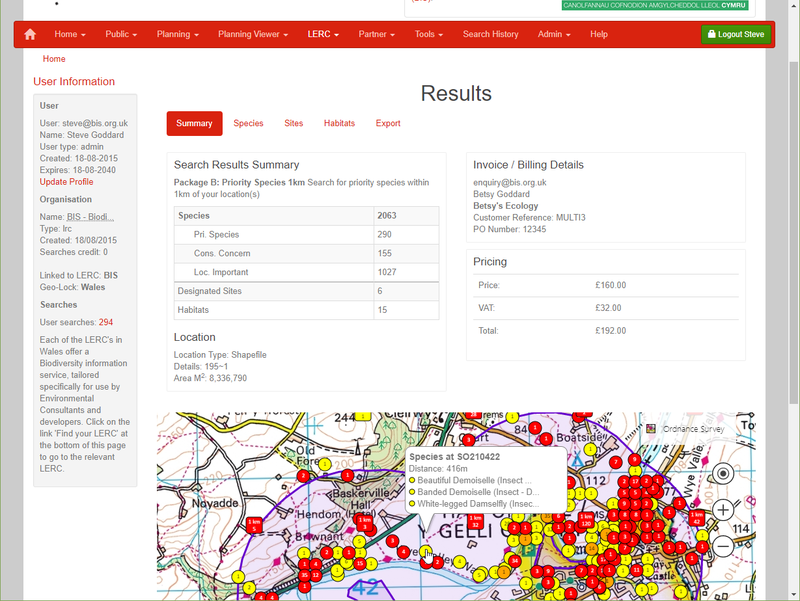 Aderyn provides many advantages including the ability to upload the site geometry as a shapefile. The shapefile can contain point, polygon or polyline geometry. Alternatively, a grid reference can be specified when completing the DERF. Once the search location has been set, you can choose one of a number of standard packages shown below . Once the online DERF is completed, it is automatically emailed to the LERC. The DERF is then partially processed and a quote is emailed to you. Once you accept the quote (via a link within the quote email) and your search is processed, you will receive a link to view the results online within Aderyn (and within Cofnod eMapper). 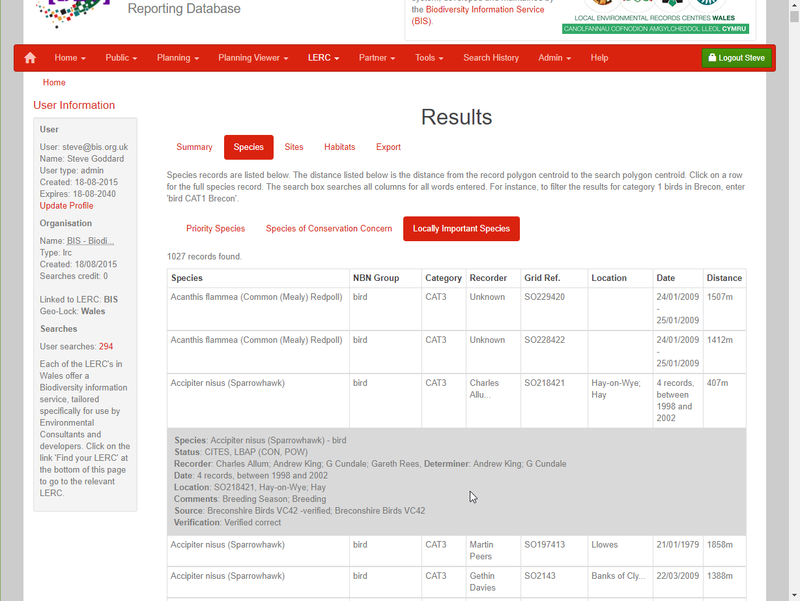 Results include designated sites and habitat information and can be printed (via eMapper) or downloaded in CSV (Comma separated value / spreadsheet) and shapefile format. The following formats are supplied for all completed DERFs. *The 'from' prices shown above are based on a point search. If a polygon / polyline is supplied thus enlarging the search area, the price will increase incrementally based on the overall area of search. Before starting to complete a DERF, please check your search location is within the BIS area. 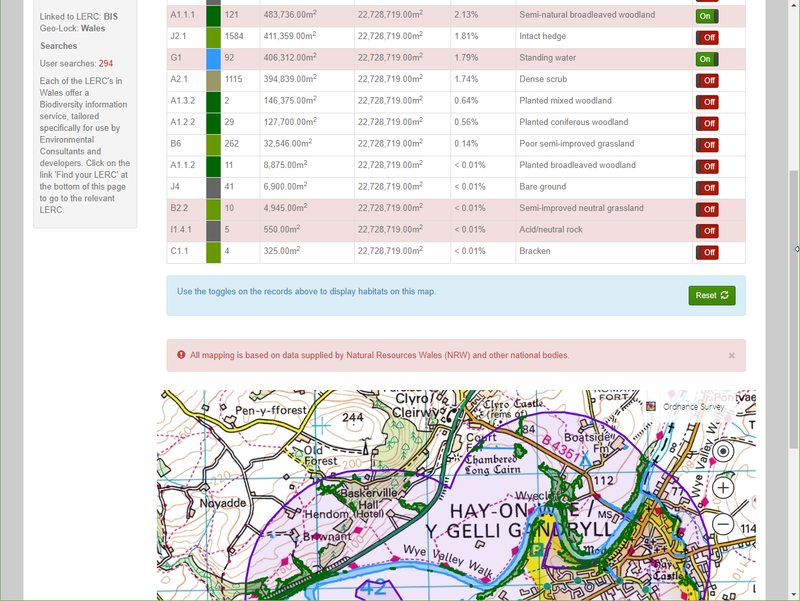 This can be done using the Wales LERC Finder Tool. It is also recommended that you check whether we hold records for the 1km grid square that your location falls within. 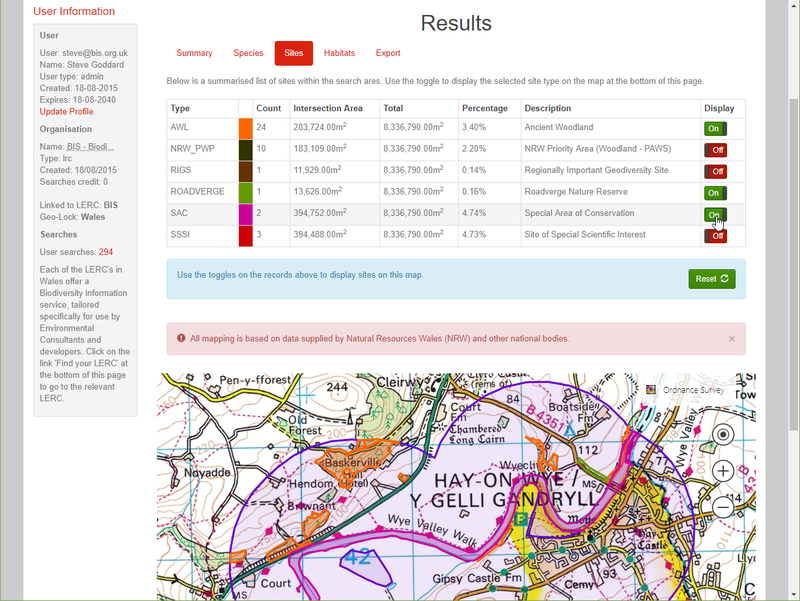 You can do this using the 'What's in my Area' tool on LERC Wales Aderyn. If you are a non-commercial customer such as a charity, please still complete an Aderyn DERF, but select the appropriate category on the invoicing page. Charities or not-for-profit organisations may be charged at a 33% discount. Normally public, student and research enquiries are free. If none of the packages above meet your needs, please contact us for other options. Invoices will usually be sent out by email within a month of the DERF being completed. Payment terms are 30 days. Invoices provide the option to pay directly by debit or credit card. Please let us know if you cannot comply with these conditions or if you have any particular invoicing requirements (e.g. order numbers) to help speed up payment. Please note: BIS will not release full sensitive data to the public and will not invoice commercial third parties eg.consultancy clients. To start the Data Enquiry (DERF) Wizard, click the button below.